Florida Armenians is pleased to announce that 38 out of 39 candidates endorsed by Florida Armenians have won election to various offices across the State of Florida. The 97% success rate of Florida Armenians endorsed candidates illustrates the power and effectiveness of the Armenian American community in Florida at the federal, state, and local level. All thirteen Florida Armenians endorsed candidates for United States Congress were elected, including Republican challenger Carlos Curbelo who defeated Democratic incumbent Joe Garcia in FL-26, which covers southwest Miami-Dade County and all of Monroe County. In the state legislature, all four Florida Armenians endorsed senate candidates won election. In the state house, fifteen out of sixteen Florida Armenians endorsed candidates won election, including HD-67 Republican Chris Latvala who easily defeated Democrat Christopher Shepard in the open-seat contest. Christ Latvala is the son of State Senator Jack Latvala (R-Pinellas), who introduced and managed the successful passage of the first Armenian Genocide resolution in the Florida State Senate in 2013. The only loss of all Florida Armenians endorsed candidates in the 2014 election cycle occurred next door to Chris Latvala, in HD-68, where Bill Young lost his challenge to Democratic incumbent Dwight Dudley (D-Pinellas). Bill Young is the son of the late C.W. Bill Young III (R-FL), who represented Florida in the United State Congress from 1971-2013. At the state executive level, all three Florida Armenians endorsed candidates coasted to victory. Although Florida Armenians withheld our endorsement in the hotly-contested Florida Governor race, we would like to congratulate Governor Rick Scott on his reelection victory. We look forward to working with him and his administration as we approach the Armenian Genocide centennial in April 24, 2015. Florida Armenians also endorsed Garo Artinian, the sole Armenian American on the ballot in Florida. He won an uncontested race and is now the North Palm Beach County Improvement District Seat 2 Board Member-elect. Florida Armenians would like to congratulate all of our endorsees across the Sunshine State on their election victory. TALLAHASSEE, FL – Yesterday, the Florida state Senate adopted SR 1878, the Armenian Martyrs Remembrance Day resolution to mark the 98th anniversary of the Armenian Genocide, reported Florida Armenians. Armenian-Americans from Miami and Boca Raton joined members of the local Tallahassee Armenian community to mark the historic day. “It’s like a weight lifted off my back,” stated Margaret Atayants, a student at Tallahassee Community College. “I’m grateful to the Florida Senate for honoring and recognizing the victims of the first genocide of the twentieth century,” she said. Senator Jack Latvala (R-Pinellas) introduced SR 1878 and spoke in favor of the resolution on the Senate floor. He then recognized Armenian-American community members observing the historic moment from the gallery. “The entire St. Hagop Armenian Church community of the Gulf Coast is thankful for the efforts of our elected officials,” stated Rev. Fr. Hovnan Demerjian, pastor of St. Hagop Armenian Church. “Each time a genocide recognition resolution is introduced and passed, a small bit of justice is served for victims of the Armenian genocide and all victims of genocide and mass-atrocities,” Fr. Demerjian said. In 2006, Florida Governor Jeb Bush issued an official proclamation recognizing the Armenian Genocide. However, the Florida legislature had not affirmed this crime against humanity until yesterday. “This is a historic day for Florida and for all Armenian-Americans,” stated Taniel Koushakjian. 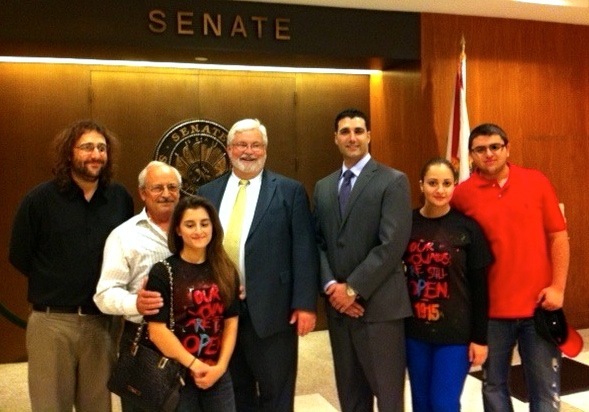 “On behalf of the entire Florida Armenian-American community, we thank Senator Latvala, Senate President Gaetz and the entire Florida Senate for their leadership on this important human rights issue,” stated Koushakjian. Florida Armenians would also like to recognize and give special thanks to Henry Petraki and the Atayants family for their steadfast efforts and support.